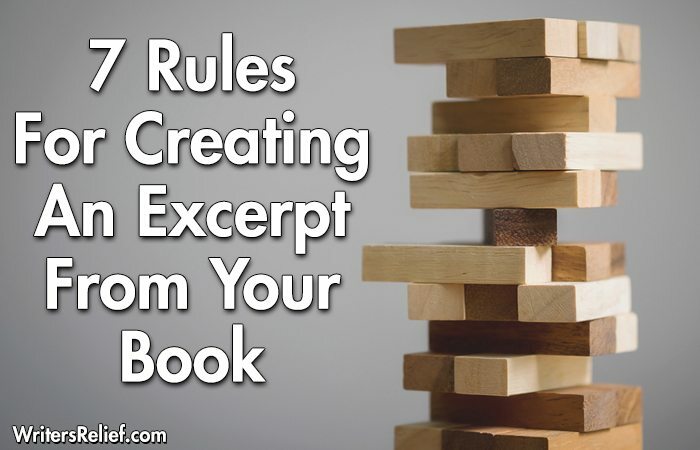 7 Rules For Creating An Excerpt From Your Book - Writer's Relief, Inc. The potential benefits of creating a book excerpt are enormous. Creating a book excerpt is like focusing a microscope over a given section of your story: It can bring out all kinds of details you might not have otherwise seen. Excerpts can also help you get your book published; literary agents get excited about reading manuscripts when the author can boast that certain passages have already been published in literary journals. And after your book is published, excerpts can be used as free digital goodies to entice readers to join your mailing list. Ready to create a stand-alone excerpt from your book? Here’s how! Focus on character. Great book excerpts draw people in by offering deep explorations of fascinating characters and what makes them memorable. Use your book excerpt to examine your characters under a microscope. Zero in on a moment of drama. While you don’t have to focus on a passage that involves exploding cars or military shoot-outs, it’s a good idea to choose a selection from your book that has a fair amount of dramatic tension. Usually, the best moments to excerpt come when a character is on the brink of making a decision or on the precipice of deep, personal change. Choose creatively. Your book excerpt doesn’t need to be your story’s first few pages: With a little ingenuity, you can discover a good selection for an excerpt in the middle or even at the end of your book. Consider slice-of-life. The slice-of-life format can work very well for book excerpts. Learn more about writing slice-of-life pieces. Don’t bite off more than you can chew. A book excerpt doesn’t have to tell the story of a whole book; it just has to show a little sliver of it. If your excerpt doesn’t have a “perfect” ending—and instead feels open-ended—don’t sweat it. Your goal is to offer a little window into a character’s life—not to tell an entire life story. Edit wisely. You don’t have to stick to your book’s original draft in order to create an excerpt—feel free to tweak, revise, or even rethink your pages. If your changes are substantial, you can use your author bio or byline to indicate that the text has been slightly modified (or even abridged) from what appears in your original book manuscript. Keep it short. If you’re shooting for publication in a literary journal, go for a tight word count of 3,500 words or fewer to increase the number of markets available for this particular piece. If you have self-published your book, your excerpts might not be eligible for publication in most literary journals because the submission will be considered previously published. Also, making your book excerpt available to readers online before sending it to literary journals might push it into previously published territory. Another element to consider is whether or not your story is “literary” enough for publication in literary journals. If you’re writing in one of the commercial genres (like thrillers or romances), you may find it more difficult to place your book excerpt in a literary journal. You’ll need to focus on finding lit mag editors who are friendly to your book genre. But the effort may be worth it. Publishing in a literary magazine can help you reach new audiences and put your work in front of the “right” people. Plus, getting your book excerpt published feels great! QUESTION: Have you created a book excerpt? Tell your fellow writers how you made the decision about which selection to choose. According to Merriam Webster Dictionary, “Excerpt” means to take or publish extracts from (something, such as a book). I’m trying to understand more about English and basically the details about writing. Now for a phrase to qualify as an excerpt, is it necessary for the phrase to be already part of a published book.? What I’m understanding is that it is not necessary given the fact that according to the Writersrelief.com article, some writers use an excerpt of their writings before they are even published. Can an excerpt also refer to someone else’s written infomation, as in a written article for a newspaper publication, or a letter to be used as a publication? I am a beginning, self taught writer( read countless works of fiction, reference books, and guides on writing) I am applying for a fellowship and took an exert from my novel that was mid-chapter but wasn’t sure how to submit. So I did an internet search on formatting to see if I should format it like the beginning of a chapter or at top of the page. I didn’t find the answer on this website but still found valuable information.